Next week is December school vacation, so the Aquarium will be filled with families! However, the week before the holidays is pretty quiet, making it a great time to visit. One of the many benefits of coming to the Aquarium when it isn't extremely busy is that you can spend more time looking at the exhibits and closely observing the many inhabitants. And one of the best exhibits to take a closer look? The Trust Family Foundation Shark and Ray Touch Tank! 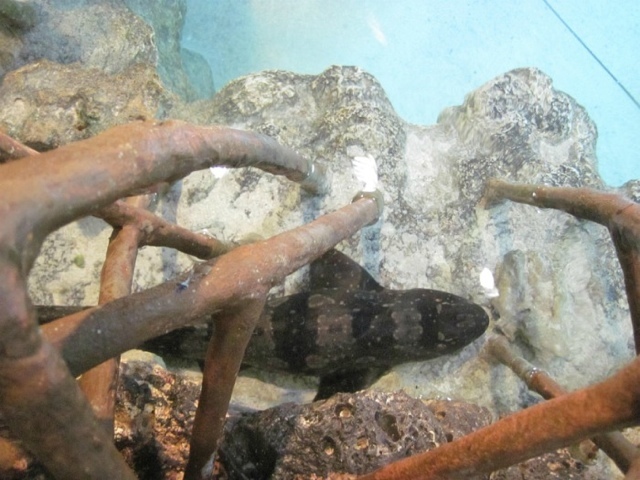 Two animals that get overlooked during the hubbub of the summer are the whitespotted bamboo shark (Chiloscyllium plagiosum - previously mentioned in this post) and the brownbanded bamboo shark (Chiloscyllium punctatum). Both species tend to rest and hide throughout the day, making them less likely to be seen during the course of a visit. 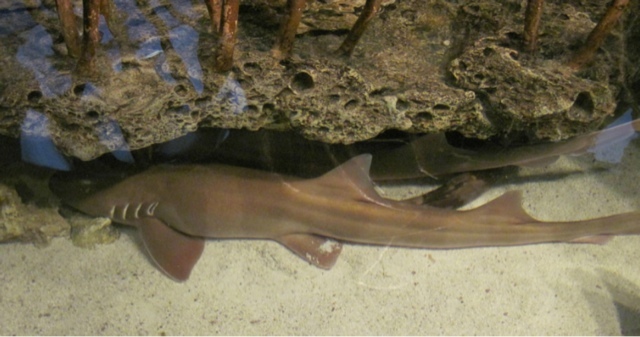 Both species of bamboo sharks are benthic-type sharks, spending much of their time on the sandy bottom. To prevent being bothered by other animals (or predators) the sharks will find hiding places in which to rest. 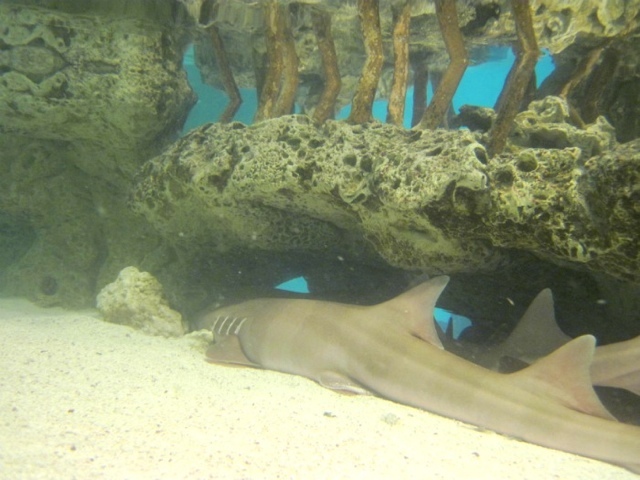 Coral reef overhangs or mangrove roots provide great cover and allow the sharks to rest in peace and quiet. And as our exhibit has lots of overhangs and roots, our exhibit animals take full advantage of these spaces! Some of the many mangroves in the exhibit-can you find the sharks? So next time you are at the shark and ray touch tank, take a peek under the coral pieces that dot the exhibit or among the roots of the mangrove trees. 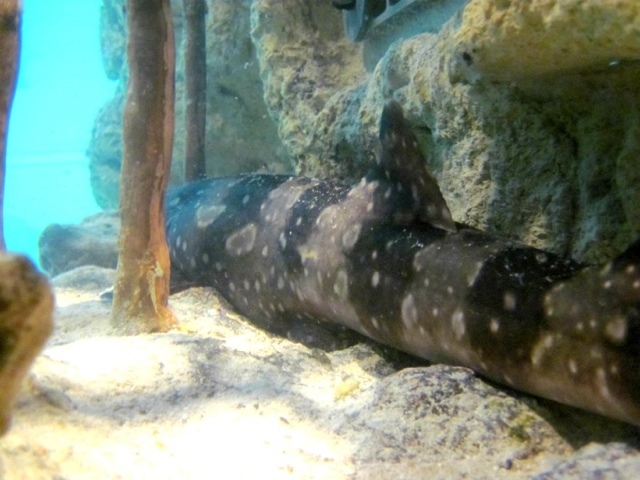 You may just spot a shark resting on the sandy bottom.